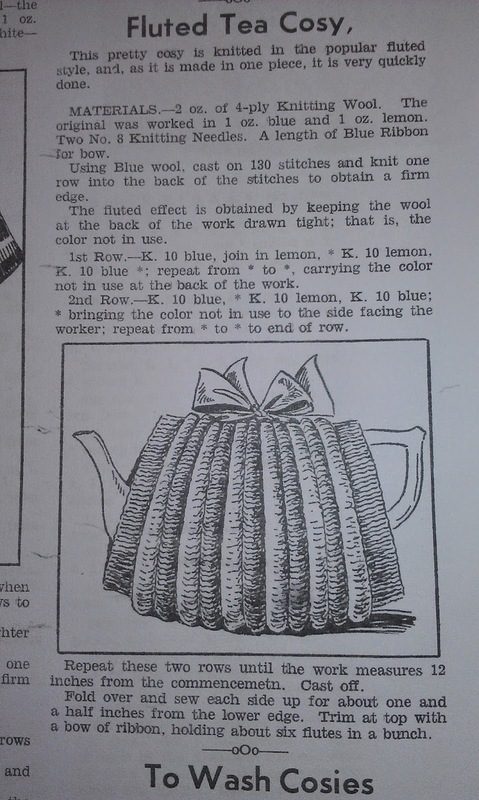 The pink fluted cosy from the 1935 pattern published by Madame Weigel in Melbourne. You'll need a pair of 4mm needles, 100g of the main colour in 8 ply yarn, and 50g of the contrast colour. I've used a variegated yarn as the contrast colour, and that's produced the striped effect. The finished cosy measures 26 cm wide and 18 cm high; this fits a medium sized pot, around 4 cup capacity. You could gather up the middle flutes with a ribbon, or use an I-cord as I did. In the original, 7 flutes are gathered. I've gathered 9. Do whatever fits your pot the best. 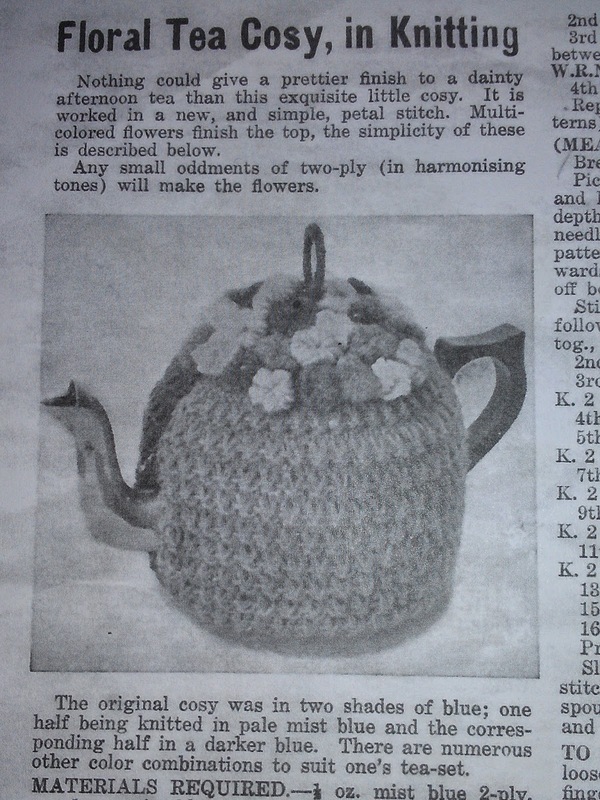 The rose and leaves are the same ones you'll find under the 'Crochet tea cosy' tab. Using the main colour, cast on 130 stitches, and knit one row. Next row, knit 10 stitches; join in the contrast colour, knit 10. Using the main colour, and compressing the stitches already knitted, knit 10. Let that thread hand loose at the back, and, compressing the knitted stitches, knit 10 in the contrast colour. Continue alternating all along the row, finishing with 10 main colour. Next row, knit 10 main colour, bring the yarn forward (to the wrong side of the work); pick up the contrast yarn (which will be facing you); bring it to the back, and knit 10; yarn forward. Pick up the main colour, yarn back and knit 10. Repeat this action to the end of the row. These two rows are repeated until the work measures 36 cm, or a few cm more, depending on the size of the pot. The original pattern says 12 inches; but this is way too short. Fold over and sew the sides together for about 4cm. Locate the middle row of the work, and gather together 7 flutes along this line. A ribbon or an I-cord can be threaded through the knitting to hold them together with a bow; you'll need a length of about 60 cm. 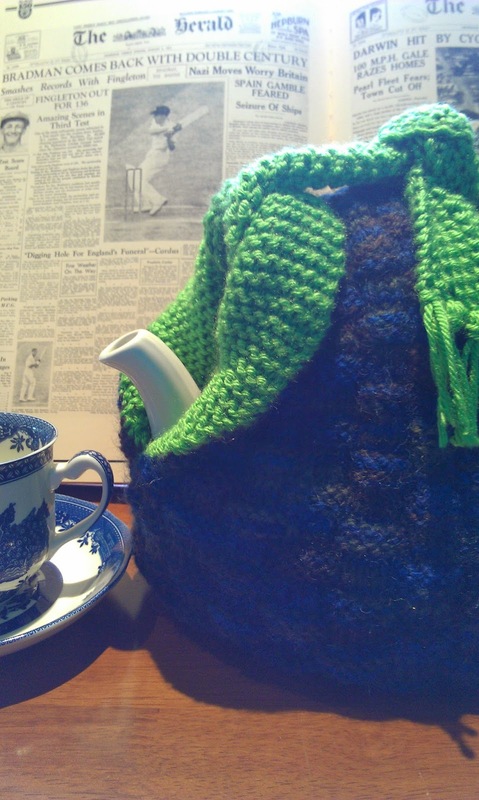 This beautiful tea cosy is from a vintage pattern, and is an entry into the tea cosy competition. It's so colourful! I have a copy of the pattern somewhere and will put it on here soon. Yellow cosy from the 1930's, Madame Weigel's Cushions and Cosies book. 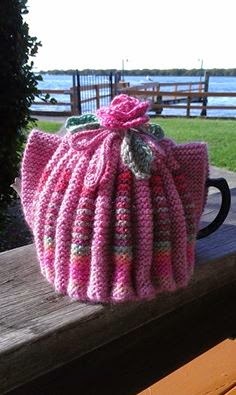 I remember my Grandmother having one of these tea cosies back in the 1950's. It was in green and a mustard yellow. This is an adaption of the original pattern...the yarns were different then, but the original pattern mostly works. For the flowers on top, I've wound the yarn around my fingers as it says in the original...however I recently saw a great idea...wind the yarn around the prongs of a fork to give a more compact and neat flower. You'll need 8ply yarn for the lining and top. The pattern on the outside is knitted with 2 strands of 4 ply yarn, about 25 g of each 4 ply, 50g 8 ply. The one in the photo was knitted with 2 strands of the same colour; using 2 different colours gives a nice effect, too. K=knit, P=purl, WRN=wool around needle, M1=make a stitch by knitting the yarn between 2 stitches. Using a pair of 4mm needles, and 2 strands of 4 ply yarn, cast on 46 stitches. Row 2. Knit 2 together all along the row. Row 3. ( K1, WRN, M1, WRN), repeat to the end of the row; finish the row with WRN, M1. Repeat these 4 rows 9 more times. Break off the yarn, and leave the stitches on the needle. With the right side facing you, pick up and knit across the cast on stitches, using the 8 ply lining yarn. (46 stitches). Knit in garter stitch (all rows in K stitch), until it measures the same as the patterned piece, ending with the needles on both ends of the work, pointing in the same direction. Fold the work with the right side of the patterned piece facing you. Hold the 2 needles with the stitches together, and with the 3rd needle and the 8 ply yarn, knit 2 stitches at once (one from each needle). 46 stitches. Row 2, and every second row, P2 tog, P to last 2 sts, P2 tog. Make the other side of the cosy the same as above. Slip stitch together the sides of the lining to the patterned pieces. Sew the sides and tops together, leaving enough of an opening to fit the handle and spout comfortably. Wind one strand of 4 ply firmly around 2 fingers of the non-dominant hand...about 28 times.Slip the loops off carefully, and use the ends of the yarn to tie securely in the middle. Alternatively, wind the yarn around the prongs of a fork; tie securely in the middle, then slip off the for. 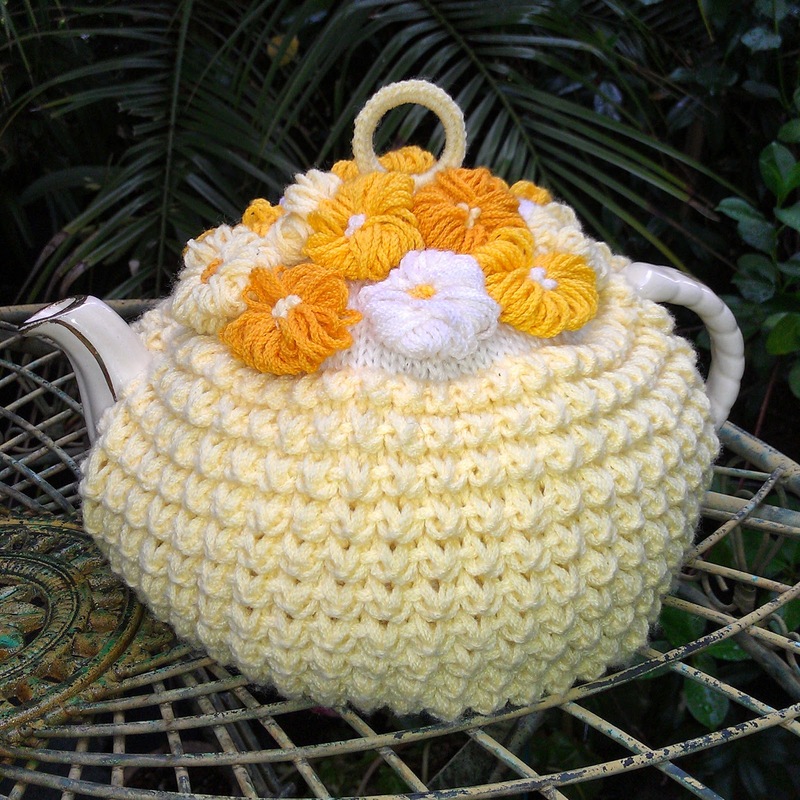 Sew the flowers onto the top of the cosy; work 3 or 4 French knots in the centre of each flower in a contrasting yarn. Work as many flowers as needed to cover the top. Work double crochet around a ring of 3-4cm diameter. Sew to the top. Vintage and blokey...as not all tea drinkers are women.. 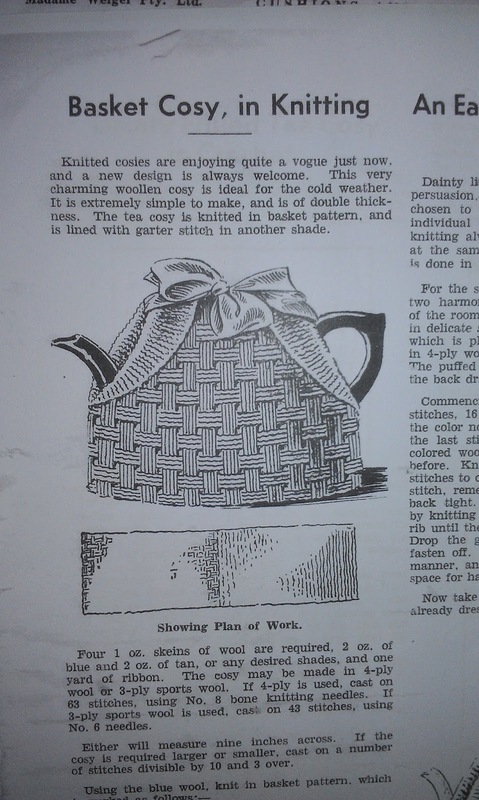 The pattern was published in 1935, one of Madame Weigel's popular designs. She had it illustrated with a pretty satin bow, quite feminine. But I had some blue and grey variegated yarn, not very feminine at all. So the satin ribbon has been replaced with a moss stitch scarf! I've had to modify the instructions quite a bit, as the pattern didn't work out in the original version. You’ll need 100g of 8 ply yarn for the outer patterned layer, and 100g of 8 ply yarn for the lining; which is featured as a contrast as it folds over at the top. This cosy could be knitted in many decorative stitches; it could be a scarf that was never finished, adapted to become a tea cosy. Tension, measured over lightly pressed fabric, using 4mm needles. Basket stitch: 22 stitches and 32 rows measure 10cm x 10cm. Using 8 ply yarn, cast on 63 stitches. Row 2 *Purl 3, knit 7* Repeat to the end of the row. Row 3 *Knit 3, purl 7* Repeat to the end of the row. Row 6 Knit 5, *Purl 3, knit 7*. Repeat to the last 5 sts; k 5. Row 7 Purl 5, *Knit 3, purl 7*. Repeat to the last 5 sts; p 5. Row 8 As row 6. These eight rows form the pattern. Continue knitting till the work measures approximately 40 cm. Break off yarn, and join in the lining yarn. As you knit the first row of the lining, decrease 12 stitches evenly across the row. This is because the garter stitch produces a wider fabric than the basket stitch. Knit the 51 remaining stitches (garter stitch) until it’s the same length as the basket stitch section; cast off a little loosely. Remember that you now have 12 fewer stitches, and the cast-on and cast-off rows will be sewn together. Fold the work in half lengthways, and sew together the cast on and cast off edges. Slip stitch the lining to the patterned side along the other 2 edges. Fold in half again, and sew the sides together for about 2 cm on each side. Fold the tops back to show the lining, and secure with a few stitches. You can then either buy about a metre of pretty ribbon and tie a bow, or knit a little scarf using 9 stitches, knit 1, purl 1, across every row. Add a little fringe to the ends to finish it off. 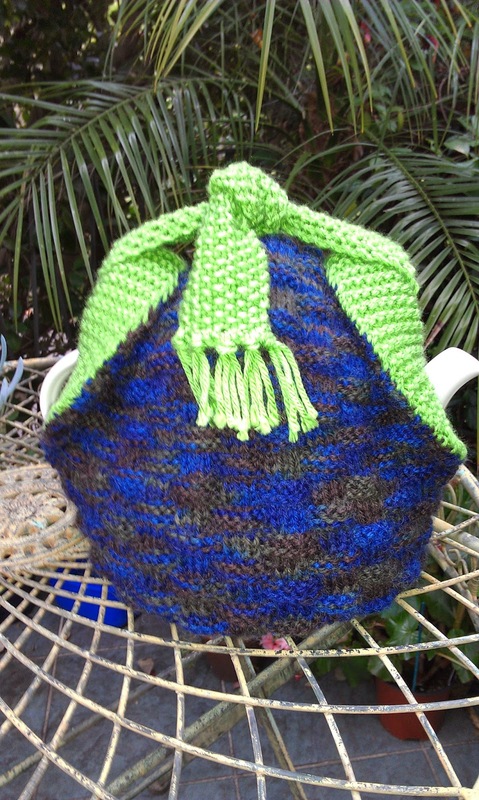 Send your entries to the Tea Cosy Competition, PO Box 109, East Ringwood, Vic 3135, before 26th June, 2015. All entries will be on display and for sale at Warratina Lavender Farm, 105 Quayle Rd, Wandin Yallock from 4th to 19th July, 2015. 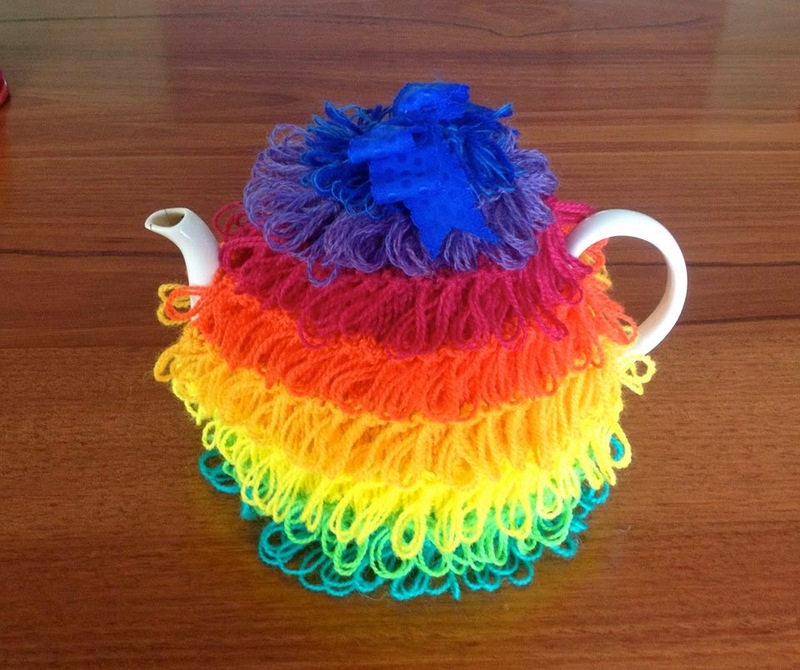 The prize for the best tea cosy is $250, so don't forget to add your contact details.